I’ve owned some form of mobile phone for almost 12 years now, and despite that length of experience I still drop the damn thing at least once a day. Thankfully I’ve avoided any serious damage to the phone thanks to a $20 plastic case. To promote the Honda N-WGN — a light automobile produced specifically for the Japanese market — engineers at the car maker (apparently with lots of free time on their hands) have created the ultimate safe smartphone case. The (apparently) working, yet bulky prototype deploys a series of airbags when dropped. 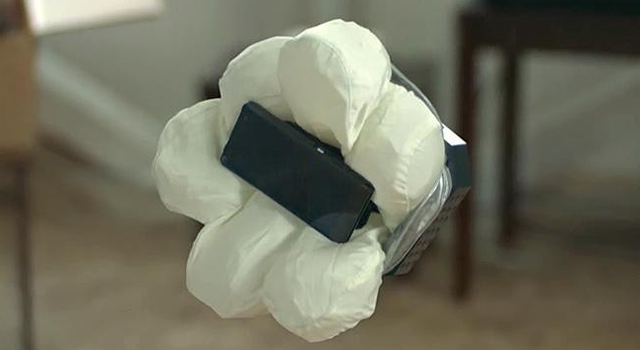 According to the video, an accelerator detects when the smartphone is falling, and within 0.2 seconds gas is released from a C02 cartridge inflating the 6 airbags contained within the case. 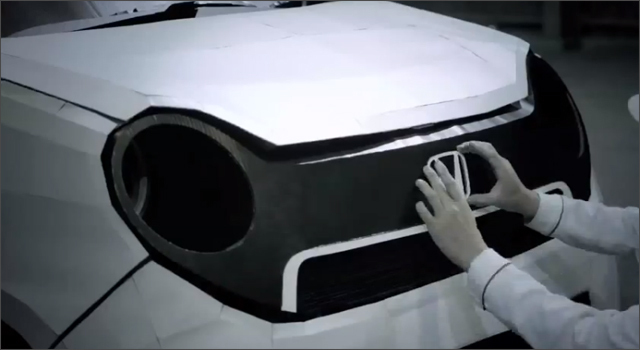 Last year, Honda created a 1:1 cardboard model of the N-ONE that dedicated fans could download, print and assemble. Sound by Honda is a mobile app created by internavi lab as part of Honda’s Dots (Design Our Transportation Story), a two way information and communications service. the app leverages the smartphones GPS and accelerometer allowing a user to experience the sound of several Honda cars including the Acura NSX-R, S800, Civic R, NII360 Town and the McLaren Honda MP4/5. 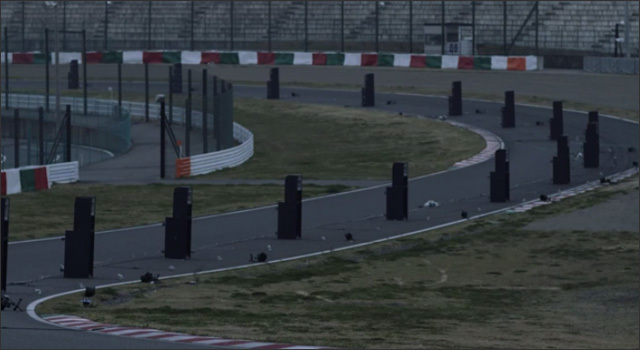 To promote the app Honda used telemetry data collected during legendary Honda/McLaren driver Aryton Senna‘s record-setting qualifying lap at the 1989 F1 Japanese Grand Prix at Suzuka. The data collected from the car’s onboard telemetry was used to create the experience of sound and light. Speakers and lights were placed around the Suzuka Circuit along the path that Senna’s car drove on that day, and once night fell the record-setting lap was brought to life using a trail of light and the scream of the Honda/McLaren’s engine. Back in May, the folks at Top Gear had an idea to create an enhanced version of your everyday ride-on lawnmower. Honda UK and Team Dynamics, who campaign Honda Racing’s Civics in the British Touring Car Championship, took up the challenge. They began with Honda’s regular HF2620 Lawn Tractor, and re-engineered the mower from the ground up using an all-new fabricated chassis made from 4130 chromoly, added custom-built suspension, ATV wheels, and a steering rack taken from a Morris Minor. The engine was swapped out for a 1.0 liter engine from a Honda VTR Firestorm, the grass bag provided space for a bigger fuel tank and a high capacity oil cooler and a water cooling radiator were added. 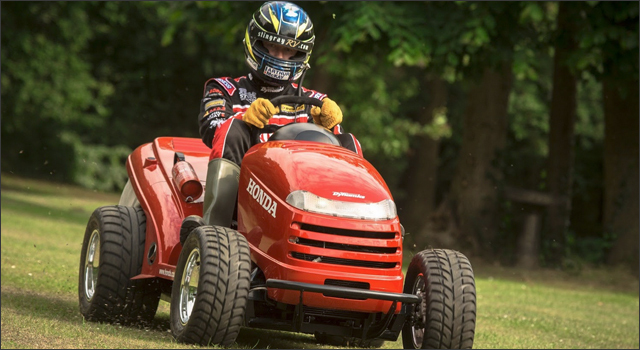 While the Honda Mean Mower can top out at 130mph (209 km/h) on the track (here’s a video featuring Top Gear’s Stig), it still needs to be driven at a more neighbourhood-friendly speed of 15mph when actually cutting grass. Get out your scissors and gluesticks, this may just be the ultimate project for the crafty crafter. To promote the new Honda N-One, Honda and ad agency Denstu created a model kit that can be printed, cut-out and assembled as a cardboard and paper 1:1 scale version of the car. But, why just watch the video when you can assemble one yourself. The Honda N-One model kit is available for download in 1:1 scale, or for those with more realistic ambitions a 1:9 scale model is also available. The 1:9 version even comes with a full interior for you to assemble! As part of their ongoing ‘Honda Loves You Back‘ campaign, Honda loved back up and coming LA-band Monsters Calling Home by surprising them with an appearance on ABC’s Jimmy Kimmel Live. The band – who had shot a video for ‘Fight to Keep‘ completely inside their own Honda Accord, CR-V and Fit back in the spring – had been told that they would get a chance to play in front of several hundred Honda executives. After they had set up their instruments on stage they were told that an important meeting had gone late and there would be no performance. At the request of the event coordinator, the band agrees to perform one song anyway and they take the stage. Soon they are interrupted and the truth is revealed. There never really was a concert for executives and the band will instead be performing on Jimmy Kimmel Live just across the street. What they had thought was their worst gig ever, turned into a fantastic opportunity for the band. Honda is looking for people to share stories about the #FirstHonda they owned. They’re kicking off the campaign with the story of Tim Mings. As a kid, Tim worked with his father on Honda N600s on the weekends. The Honda N600 was first introduced to North America in 1969 as a 1970 model, with around 25,000 of the cars sold before being replaced with the first generation Civic in 1973. 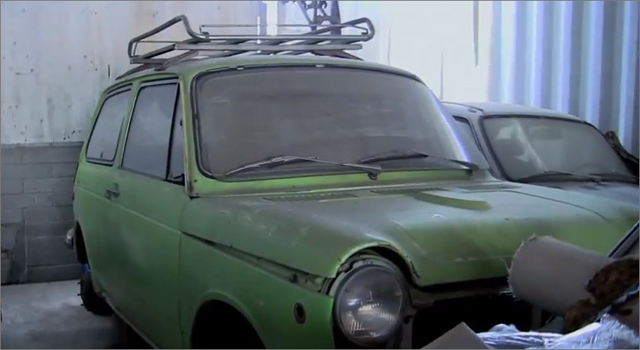 Naturally, Tim’s first car was a Honda N600, and he eventually turned his hobby of fixing the cars into a career as the only full-time Honda N600 mechanic in the world (according to the video). Tim recently discovered N600 Serial Number 1, the very first Honda officially imported into the US, and has begun a careful registration of the historic vehicle. The #FirstHonda campaign comes from Santa Monica agency RPA. 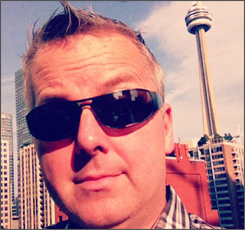 John Hughes movies are virtual documentaries of what life was like in what 80s (or at least what we remembered it was). Sixteen Candles, Pretty in Pink, The Breakfast Club, are all classics. But for this 80s survivor, ‘Ferris Bueller’s Day Off’ stands head and shoulders above them all. With it’s mild suburban anti-establishment theme, we cheered as Ferris pulled one over on his parents, stuck it to Principal Rooney, drove his sister insane and enjoy a day off in downtown Chicago with the lovely Sloane and his best friend Cameron. Does everyone remember Charlie Sheen’s cameo as the drugged-out guy in the police station? Now 26 years later, (sorry, I’ll wait a few seconds for you to recover from that shock) 49 year-old Matthew Broderick (yep, 49) is way overdue for another day off. This time he’s sneaking off for a day of adventure around Los Angeles to promote the launch of the 2012 Honda CR-V. With all respect to the good folks at Honda, the CR-V is not even close in the ‘sweet-ride’ department as the Ferrari GT250 California Spyder featured in the original movie. However, trying to jam a couple of child’s car seats and a full load of groceries are tasks much better suited to the CR-V. The ad will be featured during the Super Bowl this weekend, but the full extended version was released today. 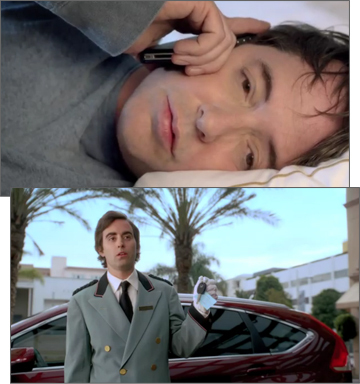 The commercial features more than two dozen references to the original movie. If you can spot them, Honda is asking people to post them to Twitter using the #dayoff hashtag. In 1980 Ozzy Osbourne had just released his first solo album ‘Blizzard of Ozz’ featuring guitar shredder Randy Rhoads. The song ‘Crazy Train’ has gone on to be a rock classic that transcended the world of heavy metal to become of popular culture at sports events, commercials and TV shows. The latest use of ‘Crazy Train’ is in the wonderful new TV spot for the Honda Pilot. 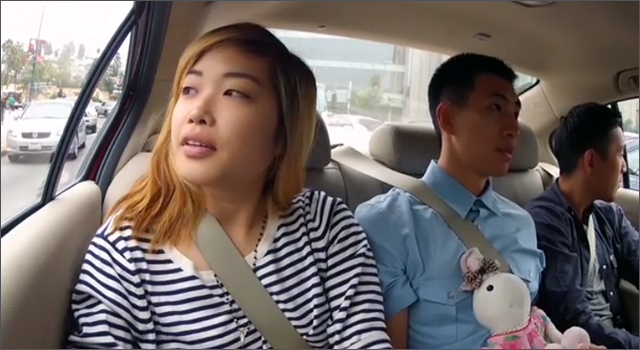 A bored looking family is seen driving along, when one of the kids starts to sing the bass riff from the song’s intro. The young girl in the middle seat joins in with Ozzy’s distinctive ‘aye aye aye’, another kid shakes his cup full of ice to mimic the percussion sound of the vibraflap (yes, I had to look it up). Soon the whole family has joined in creating an amazing accapella, with dad providing the lead guitar parts. 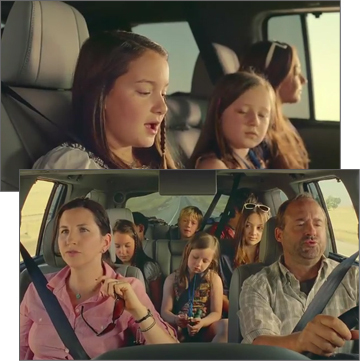 There was singing on our family trips too, but they were mostly off-key but well-intentioned renditions of Johnny Cash’s ‘Ring or Fire’ or Roger Miller’s ‘King of the Road’. The ad comes from American Honda’s ad agency RPA and was produced by Imperial Woodpecker.